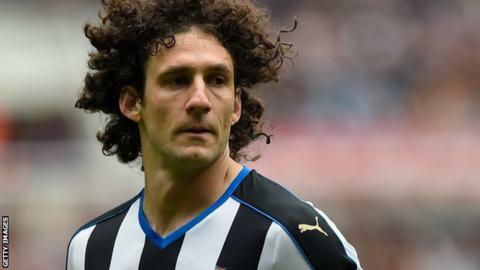 Captain Fabricio Coloccini says staying with Newcastle United following the arrival of new coach Steve McClaren was always his primary option. The 33-year-old defender has become a key part of the Magpies side since his move from Deportivo La Coruna in 2008, scoring six goals in 248 appearances. He committed his future to the club with a one-year extension this month. "I had a few offers to leave the club but I said my first choice is to be here," Coloccini told BBC Newcastle. "I felt proud because I want to be here, I feel part of this club and this city. "I expect to be fit and play every game." Coloccini was made captain by McClaren's predecessor Alan Pardew and has been with Newcastle through relegation, promotion and a European campaign in his seven years at St James' Park. McClaren told BBC Newcastle earlier this month he wanted to retain the former Boca Juniors and Atletico Madrid defender as captain and a key part of his plans. Meanwhile, the deal takes the Argentina international up to the end of the 2017 season when he will be 35, with the possibility of maybe continuing his career in the north east or maybe in his homeland. "I would like to finish my career in Europe, maybe here," he continued. "I try to speak in the present, I have a contract for two years but in the future I don't know what will happen. "I would like to finish my career in Europe but maybe I will play a few years in Argentina if I feel ok."